Are you in need of rapid access to an affordable private MRI, CT, ultrasound, mammogram or X-ray? At Nuffield Health Warwickshire Hospital, our experienced radiologists will ensure that you receive your diagnostic imaging results as quickly a possible. Why choose Nuffield Health Warwickshire Hospital for your private diagnostic imaging? At Nuffield Health Warwickshire Hospital, we have a large in-house radiology department. Our highly skilled team and modern equipment means we are in place to offer you the diagnostic tests and results you need quickly and effortlessly. To be eligible for a private test or scan, you will need a referral from your GP, Physiotherapist or Consultant to ensure that tests are clinically appropriate for you. 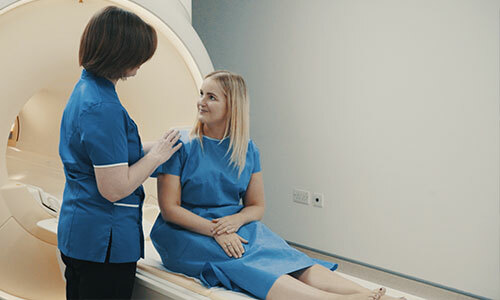 Whether you are referred for an MRI scan or mammogram, our highly skilled radiology team will make you feel at ease with their exemplary professionalism and efficiency. You can even expect to receive detailed results from your scan within a couple of days, helping you find peace of mind or the next step in your treatment journey as quickly as possible. Our radiology department is open from 8.30am - 6pm on Monday - Friday for all appointments. General radiology (all aspects of general radiography). If you are in need of a diagnostic scan and want to skip the waiting lists, you can book an appointment with one of our radiologists as soon as you receive a referral. To book, simply call Radiology on 01926 436333. Alternatively fill out a contact form below and a member of staff at Nuffield Health Warwickshire Hospital will get back to you at a more convenient time. Fill in a contact form, or give us a call for more information. MRI scans are among the safest medical procedures available yet some patients dread the experience. Here's our top tips for how to stay calm and get your scan.